On November 5, 2017, we lost our Ernest. He was preceded in death by his eldest son, Clive, a young man who inherited his dad's curly hair and his infectious smile. Ernie's impact will continue through his wife, Bella, his children, Carol (Mike), Mark (Jeff), and Helen (Scott), his grandchildren, Devon (Justin), Michelle, Anna, Mia, Sara, and twin boys, Blake and Tucker, due in December, and his newborn great-granddaughter, Isabella. Four generations of Americans that are here because a gifted Yorkshireman was given the opportunity to immigrate and had the courage to take it. Born just before the start of World War II in the northern England steel town of Sheffield, Ernie was the baby boy of the family, doted over by his two older sisters. His father, Ernest, worked in the steel mills but he and Ernie's mother, Louisa, recognized early on that their son was going to have opportunities beyond the mills of Sheffield. A talented student and musician, Ernie went to Sir John Cass College, London University. It was there that he met "that London woman", marrying Bella only months after meeting and with whom he would walk through life, side by side, for the next 58 years. An exceptional academic talent, Ernie completed his undergraduate degree in Mathematics with such distinction that he was taken immediately into his doctoral program at Birkbeck College, London University. Upon receiving his PhD, he began teaching at Sir John Cass College. In 1965, he came to N.C. State with an intent to stay six months and remained at the university for 37 years, serving as the department head for 12 years. A man of serious intellect coupled with a boyish sense of humor, Ernie was a rare combination that was always the life of the party and the tutor of last resort for his children and grandchildren for all academic pursuits. He was a talented clarinetist who had to make a choice between pursuing a career in academia or the arts, he chose academia but he continued to play the clarinet both professionally and recreationally for most of his life. In North Carolina, he took up sailing, taking his family on weekend cruises along the coast setting sail from Topsail Island. Off the water, his weekends were spent rebuilding classic British roadsters. He lived a vigorous life, enjoying running and swimming and keeping himself fit until his battle with non-Hodgkin lymphoma and the rounds of chemotherapy took their toll on his body. Ernie had his entire family at his house for his 80th birthday party just two weeks before his death. At the time, there was no reason to think that this was the last time we would all be together but, in retrospect, we are so very thankful we were. 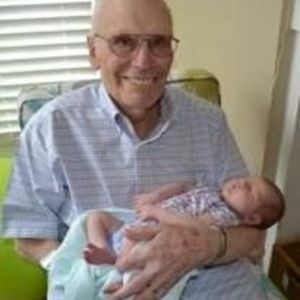 This picture of him holding his great-granddaughter shortly after her birth, she on her way into this world, he on his way out, is something we will all cherish. A marvelous life of personal distinction and worldly impact, Ernie will live on in each of us and the students he educated. For those of us that were closest to him, there will be times when we will think of his love of Frank Sinatra's voice and we will hear it, singing the words that characterize Ernie's life. A gathering of remembrance is planned at 4:00pm on Friday, November 10 at the N.C. State University Club, 4200 Hillsborough St., Raleigh, NC 27606. In lieu of flowers, please consider making a donation to either Girl Up (girlup.org) or Oceana (oceana.org).